Since moving to Cromer we have been making an 'Artists' Pilgrimage'. We drew a line on the map from Bromholm (Bacton) where there was in medieval times a great priory and pilgrimage centre, to Walsingham which also had a priory and is of course still a centre for pilgrims. We are gradually working our way along 'the line', visiting and drawing and photographing the villages and churches, and making books about it all- purely for our own enjoyment! We have only managed to get about halfway so far but that has already involved 20 churches. I have been painting for many years and I particularly enjoy painting outdoors in oils or watercolours- the changing nature of the light on the landscape or buildings is a constant challenge, and the fleeting colours and shadows are always a source of inspiration. 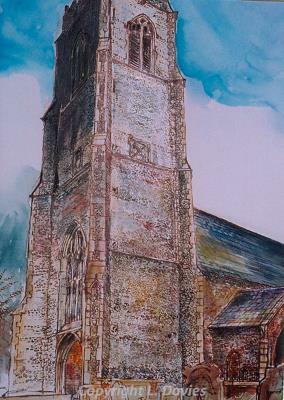 Our 'Artists' Pilgrimage' is taking us to villages and churches we might otherwise have missed. Many of the churches contain images of angels, in stone, wood and glass - and these have been a source of inspiration in much of my work, either directly as a basis for a piece of glass, or more indirectly as an influence on ideas and concepts. 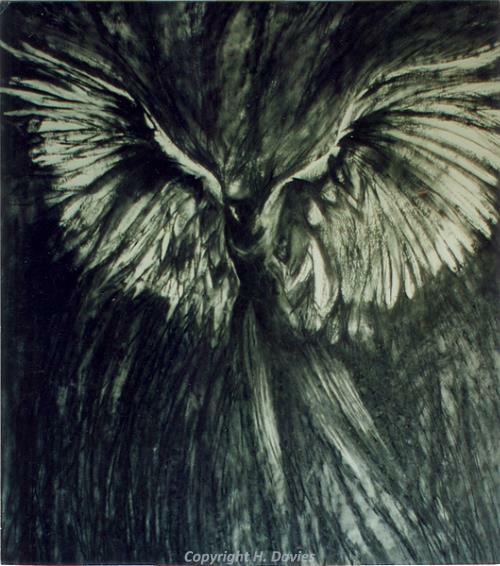 The angel in this image is drawn in charcoal and is quite large - about 4 feet high. He is called the Messenger and is the idea of Gabriel. 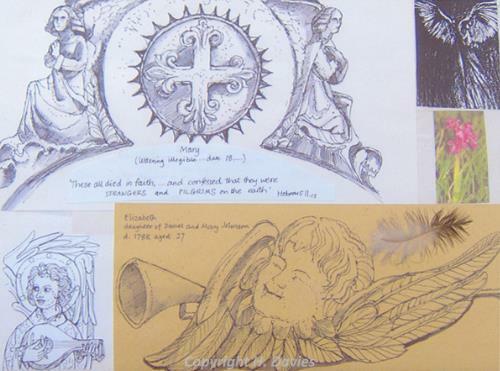 I drew these images (there are two other angels) for an audio-visual sequence which is a meditation on The Annunciation of Christ to Mary. Using projected images (slides) and music I create a programme which lasts about 25 minutes and gives time for meditation in the context of sound and vision. Locally, this has been shown in Sheringham.